Once at the user’s profile, you can verify whether they are a troll or perhaps just made some sort of error. (That does happen!) Usually true trolls are fairly obvious: very repetitive posts, (possibly with vulgar language) and indications that the user has few legitimate followers on Twitter. From that same profile page, you can take action. If you click the button marked with a gear on the right, a drop down appears with three options. Two of them are “Block” and “Report for spam”. The first merely blocks the person from contacting you or reading your posts automatically in their feed. Of course, unless your have set Twitter to “protect your tweets,” they can still see your posts on your profile page directly. So can anyone in the world including people who do not use Twitter. Choosing the “report for spam” option also blocks the troll in the same way. But it also notifies the folks at Twitter that this user is making a nuisance of themselves. If you use a Twitter client, many of them make this even easier by offering a pop-up menu option directly from the offending message to block the sending user. I strongly encourage you to take advantage of these options whenever possible. Twitter is aware of the problem, and has gotten very effective at responding to these signals, but they can’t respond if they don’t get them. I have seen many cases where troublesome accounts are blocked within five minutes, which is quite good. This means some users who are not logged on at the time of the trolling never even see the posts! So you taking the time to hit block might save someone else a headache. But these quick suspensions actually cause another problem. Believers are often persistent. Believers who become trolls can be unbelievably persistent. James Randi refers to them as “unsinkable rubber ducks.” A person like that is not going to let one disabled account stop them. After all, accounts are free, right? You just need an email address to activate it, and there are plenty of places that give those out for free too. There’s one particular believer who has been focusing on skeptics and atheists on Twitter since the middle of January. This person sends hundreds of nearly identical posts per day. The folks at Twitter HQ disable his account, and he creates another one. I finally gave up counting, but by the end of February this one person had gone through over three hundred different Twitter accounts. (Yes, I have evidence. I can supply the names of all 300 accounts if you wish. All but a handful are already suspended). Needless to say, this can be quite annoying if you get caught in the crosshairs. Even just ignoring and pressing block becomes incredibly tiresome. It can ruin your day. Always keep in mind the sage advice: do not feed the troll! These people feed on attention. Do not give it to them. You will just be confirming their belief that what they are doing is serving a purpose. This can be invigorating to this type of person. Better they toil away in silence and possibly run out of steam. Don’t tell them you are blocking them or reporting them. Don’t say anything, no matter how big a temptation it is. I admit this is frustrating. I have felt it. You want to lash out. Even having to press a block button seems like a huge burden when it happens 10 or 20 or 50 times a day. The repetitiveness of this led me to set out to find a better way, which I am about to explain. Rubber ducks (and trolls) may be unsinkable, but they also have other characteristics. One is that they are identical. Most of these trolls don’t have time (or, frankly, the creativity) to come up with brand new posts every time. They’ll post the same incendiary phrase or the same hyperlink to a rambling blog post over and over and over. We can use that against them. In addition to the web site, Twitter can be accessed using various client software programs. Some are in the form of smartphone apps, others are desktop clients. The key to the technique I’m about to describe is to pick a client that has a filter capability. I’ll identify several below. Unfortunately the filter capability as demonstrated in the video is not universal to all Twitter clients. Even the vendors that have it sometimes have it in their desktop version, but not in their iPhone version. Some Twitter clients don’t have anything like it. To save you some searching, below I’ve linked to the clients I’ve found that have this capability. If you are being trolled, consider switching from what you are using now to one of these clients. This one can be used from any modern web browser, there’s no software to install. Thus it’s very easy to try out. See the screencast video above for an exact demonstration of the filter feature. You can also read a walkthrough with screen shots at Seesmic’s help site. Oddly, none of the several other Seesmic client versions (Desktop, iPhone, Android, Blackberry and Windows 7) seem to have this filter feature. Hopefully that is a will be remedied going forward. I demonstrate the filter capability of TweetDeck in the screencast video above. Like Seesmic, TweetDeck supplies a walkthrough of the procedure on their support site. Also like Seesmic, this feature only seems to be in this specific version of TweetDeck, not the others. This one is not included in the video, but I did test it to ensure that it works. It is very reminiscent of TweetDeck, as it has the same three text boxes that let you filter on users, text phrases and sources. It even uses commas to separate items in the boxes, just like TweetDeck. To filter, click the gear icon at the top of the Mentions column. A pop-up menu will appear, pick the option Configure Filter. A Filter dialog will appear at the bottom of the column, containing three text boxes. Add the filter text or URL to the middle box. Separate multiple items with commas if need be. Click Apply when you are done. I have not tested this client, but it describes the exact filter feature. If you try this client out, let us know your experience in the comments. This client claims a filter function in its documentation, but it appears to be broken or disabled in the current version. There is a funnel icon on the upper right of the Mentions column, but it was always greyed. If you can make this work, let us know in the comments. After this blog post went up, both @cherryteresa and @etoile pointed out Plume. I was able to test it on my Android phone and it works quite well. In fact, it probably has one of the better filter features that I’ve seen. Here’s the procedure. While on a troublesome tweet, tap the timestamp in the upper right of that tweet. That will open some buttons below the tweet. Tap the + More… button here and in the menu which appears tap Copy to clipboard to copy the entire tweet. Now tap the other + More… button down at the bottom edge of the screen. In the menu which appears, tap Mute. That will take you to a pre-populated list of some common phrases people want to mute. You have the same three options as in TweetDeck and DestroyTwitter: text contents, users and applications. Each item in the list has a checkbox next to it so you can turn it on and off. Tap the Menu button on your phone, and in the menu that slides up tap Add. In the text box which appears do a tap-and-hold and pick Paste. You’ve pasted the entire tweet, so you’ll probably want to edit it down to just the URL. Tap OK when you’re done. Your new filter will be checked already, but if for some reason you want to turn it off, you can uncheck it without deleting the text. Very nice! After the first version of this blog post, @jackbrewster pointed out Kiwi. It is another Mac Twitter client that has an excellent Filter capability. You access it from the application preferences dialog by choosing Preferences… from the Kiwi app menu. Click Rules (yet another gear icon). You’ll see the display at right. One nice thing is this dialog is non-modal, so if you have multiple trolls at once, you can keep going back and forth from the Mentions display to the filter. Click the plus sign to add a rule. Give it a name and paste in the URL. You’ll probably want to check Ignore Case, and to leave Use Regular Expressions unchecked. Finally, choose Hide from the action options at bottom. 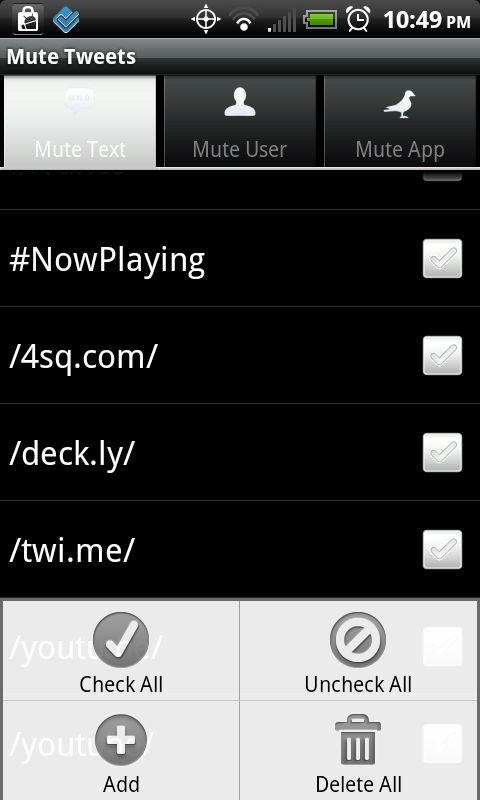 Like Plume, Kiwi lets you turn rules on and off after you’ve created them by checking a box, so it is quite flexible. Changes made in the dialog are reflected immediately in the main window. After the first version of this blog post, @baralong pointed out Tweetings. 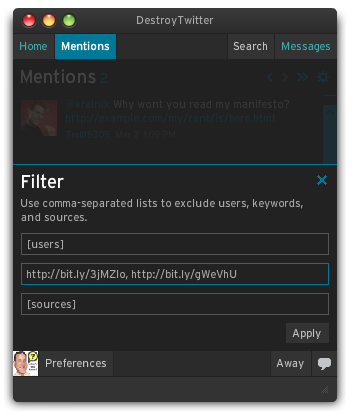 It is another multi-platform Twitter client that has a Filter capability. I haven’t been able to test this client personally yet, but based on what Doug said and reviewing the documentation, the iPhone, iPad and Mac versions do appear to have a good filter capability. There are also Chrome (browser based) and Windows versions of Tweetings listed on the web site, but those do not appear to have a filter capability. After the first version of this blog post, @AusGroucho pointed out TweetCaster. It is another multi-platform mobile Twitter client that has a Filter capability. I was able to test the Android version and I believe the iPhone version has the same feature. TweetCaster has a feature called Filter, but that’s only a temporary search. What you want is the feature they call ZipIt. It actually lets you mute that user and add their URL to your mute list in a single step, which is quite nice. Here’s the procedure on Android. (The exact procedure is probably slightly different on iPhone since it involves cut and paste). Single-tap the tweet to get Tweet Options menu. Tap the URL which will be displayed near the top of the menu. Unless you previously told it to always open URLs (not recommended!) it will stop and ask you if you want to open the URL or just copy it. Tap Copy. Single-tap the tweet again and pick Zip It near the bottom of the menu. You’ll get a list of all the users referenced in the message (including yourself if this was a Mention). You need to add the URL so tap Add at the bottom of the list. Long-tap the text box and pick Paste to paste in the URL you copied earlier. Tap OK.
Now you should have several user names and a URL in the list. Make sure only the troll/spammer’s name and the URL are checked and any innocent bystanders’ names (such as your own) are unchecked. In the display at right, the tweet was addressed to both me and @WhatsTheHarm so I’ve unchecked those two account names. Tap Zip and you are done. Once you have zipped someone like this, a zipper appears in your Mentions to let you know where the tweets were. You can tap the zipper to go back to the zip list and edit the criteria. This zip capability is so good, you might forget to report the offenders for spam. You get the report option by tap-and-hold on the tweet. 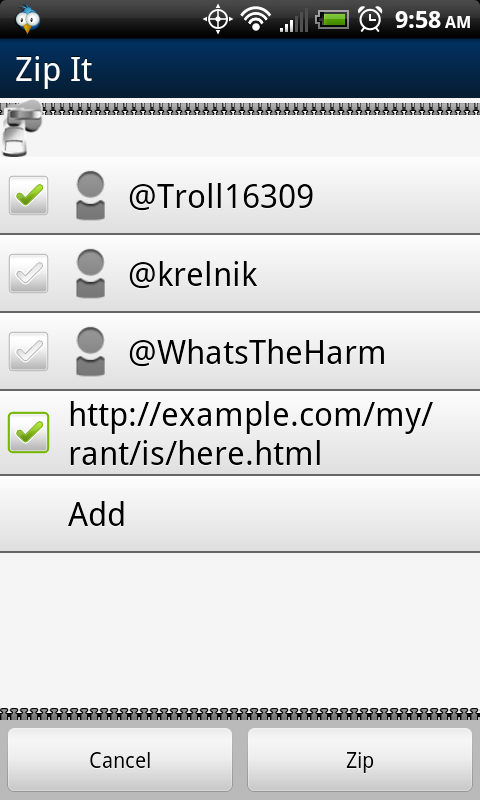 Doing that and zipping is a little bit tricky, because TweetCaster removes the spam posts right after you report them. If you can’t tap fast enough to get the Zip It menu back, just hit Zip It from another tweet, but uncheck everything from that tweet except the URL. Just make sure to copy the URL out of the offending posts before you report for spam! After the first version of this blog post @apfejes pointed out Choqok in the comments below. I haven’t had a chance to test this client, but it does appear to have a filter capability that could be used. Pick Tools then Configure… from the menu to get to it. A week after this post first went up, I saw @foresmac mention Hibari in a discussion about filtering. I didn’t test this one myself, but since Hibari bills itself as “a powerful Mac Twitter app that blocks annoyances and reveals gems” I figured it was a good choice. Sure enough, in their online documentation they show a feature they call Keyword Block that does exactly what we need. Make sure you pay close attention to the note about mentions: if you are filtering @ mention spam, you have to include your own name in the filter for it to work. Let me know in the comments if you try it out. A week after this post first went up, I saw @jasonstevenson mention Slipstream in a conversation about filtering. If you like using Twitter’s own website but want to add filtering, this is a fantastic solution. 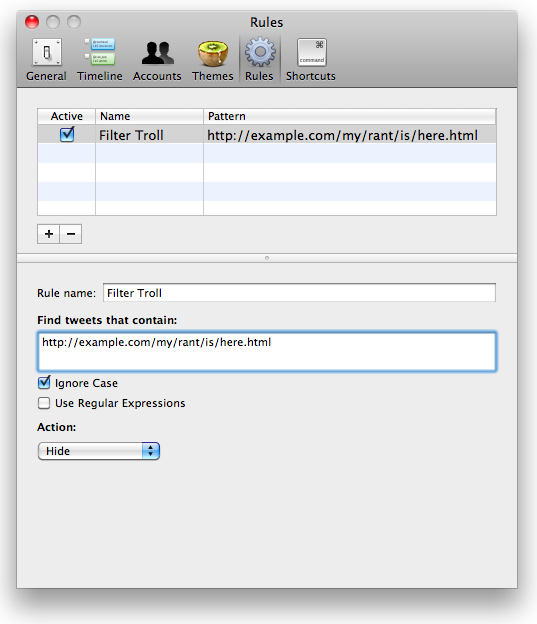 Via browser extensions for Chrome or Safari, it adds a very flexible filtering capability to twitter.com. Once you have the Slipstream browser extension installed, a new link that says Hide will appear when you hover over a tweet. Click that and a Create a new filter dialog appears. It automatically copies the entire contents of the tweet into the text box to work with. Just edit out everything except what you need for it to be unique (usually part or all of the URL). Then you can set some other criteria like whether you want this to be specific to a specific person (be sure select Anyone when dealing with trolls) and which of your feeds the filter applies to. Later, you can review and edit all your filters by clicking the stylized S that appears in the browser toolbar. 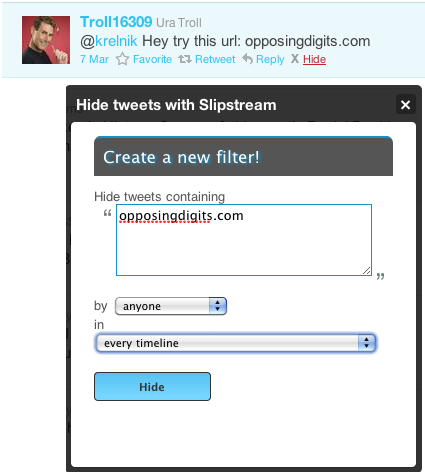 Since I sometimes use Twitter.com in addition to Tweetdeck, I’ve added Slipstream to my own personal set of filtering tools. There are many other Twitter clients, and of course I was not able to test all of them. I was able to verify that the following clients do not have a documented filter capability. Please, add comments and corrections below on these and other clients. I will update this post for future reference. Thanks for the advic and tips! Note that you added Plume for Android without deleting the line about ‘have yet to find a smartphone client that has a filter capability useful for this technique’. Thanks for pointing that out, Jim, I’ve fixed it. Cheers! Just to add to your list, Choqok for Linux/KDE also has filter capabilities. (Tools -> Configure filters.) Fortunately, I haven’t had to use it yet. Thanks very much for this! I was looking for a twitter app for Android with filtering, and this post was very helpful. Echofon does indeed have filters and a built-in Block/Report for Spam mechanism. Which versions of Echofon? Could you give some details on what the filter can do and where you access it? I just downloaded & tried out the latest Mac OSX version of Echofon, and I can’t see a filter function anywhere in that one. However, many multiplatform clients have mismatched functionality in their different versions.